Swansea City failed in a bid to sign a striker before the January transfer window closed on Thursday. They are understood to have approached Queen's Park Rangers over Jamie Mackie and Seville regarding Manu. 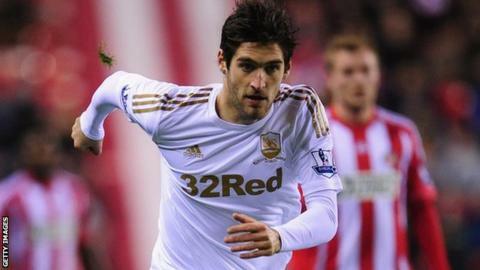 It leaves the Swans a striker short after the switch of Danny Graham to Sunderland on transfer deadline day. "They are short up front, but I'm sure Michael Laudrup will cope and he won't panic," former Wales striker Iwan Roberts told BBC Sport Wales. It is thought Swansea manager Michael Laudrup was unable to finalise a loan deal for Mackie, 27, who has scored twice in 27 appearances for QPR this season. Laudrup also approached Seville over Manu, who has scored 10 times in 34 appearances for the Spanish club. Roberts, a football pundit for BBC Wales, said the timing had left the Swans with few options. "They are a centre forward short, but to say they are red faced would be a bit harsh," he said. "I don't think they would have wanted to lose Danny Graham at this stage in the season. "They haven't really had the time to get a proper transfer target in mind to bring in and maybe they thought they weren't going to lose Danny Graham. "They're in a fantastic position in the [Premier] league, they're in the Capital One Cup final against a Division Two side and they've got one of the signings of the decade in Michu. "Hopefully he can see the next three months out and steer clear of injury. They haven't got strength in depth in that position, that's one thing that stands out now that Danny Graham has gone." Swansea travel to east London on Saturday to take on West Ham United in the Premier League.